Impangele Guesthouse and Garden Cottage is situated in Swellendam, in the Overberg of the Western Cape of South Africa. Swellendam is South Africa’s third oldest town and very centrally located on the N2 and just south of the Robertson Wine Valley. Located at the base of the Langeberg Mountain Range, Swellendam is home to the Bontebok National Park and the Marloth Nature Reserve. A quick drive takes you to the De Hoop Nature Reserve or Barrydale in the Little Karoo. This property dates back to the 1800’s and is nestled in an indigenous garden attracting many indigenous bird species. This guesthouse offers unpretentious accommodation in one of the original farmhouses of the area. The atmosphere is relaxed and our main goal is to make all of our guests feel welcome and at home. Impangele is a child-friendly guesthouse as we have toddler of our own. We love kids! Ryno and Nicolette are very passionate about the beautiful country that they live in. Have a look at their blog http://xploresawithme.com for travel tips and wonderful things to do in the area. 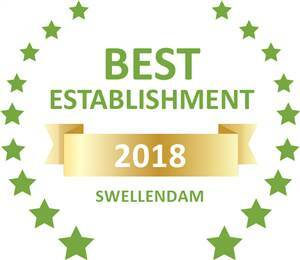 Based on reviews of establishments, Impangele Guesthouse and Cottage has been voted Best Establishment in Swellendam for 2018. Impangele is an Afristay Valued Member.